This sweeping historical narrative traces the spark of invention from the laboratories of nineteenth-century Europe to the massive industrial and scientific efforts of the Manhattan Project, and even transports the reader into a nuclear reaction—into the splitting atoms themselves. The power of the atom was harnessed in a top-secret government compound in Los Alamos, New Mexico, by a group of brilliant scientists led by the enigmatic wunderkind J. Robert Oppenheimer. Focused from the start on the monumentally difficult task of building an atomic weapon, these men and women soon began to wrestle with the moral implications of actually succeeding. When they detonated the first bomb at a test site code-named Trinity, they recognized that they had irreversibly thrust the world into a new and terrifying age. With powerful renderings of the catastrophic events at Hiroshima and Nagasaki, Fetter-Vorm unflinchingly chronicles the far-reaching political, environmental, and psychological effects of this new invention. Informative and thought-provoking, Trinity is the ideal introduction to one of the most significant events in history. <p>Jonathan Fetter-Vorm is a writer and illustrator of nonfiction graphic books. He is the cofounder of the Two Fine Chaps graphic imprint, a partnership dedicated to adapting, illustrating, and printing classical works of literature and natural science. He was born and raised in Montana and currently lives in Brooklyn. 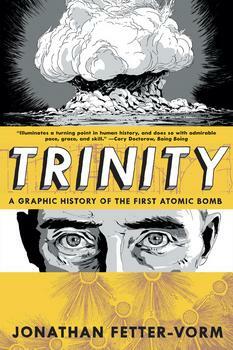 Trinity, the debut graphic book by Jonathan Fetter-Vorm, depicts the dramatic history of the race to build and the decision to drop the first atomic bomb.